I would like to welcome Mike Duggan as an official contributor for our blog. With an amazing passion for BMWs, he will delight us with an unique take on our most favorite brand. There’s a car I’ve been watching. Our local BMW dealer is just three turns from our house, on a two-lane road I travel often. The lot is well positioned along the road to allow passers-by like me to gawk at its cars as we scoot past. During the week, when traffic moves at a pace slower than I like to drive, I have plenty of time to give gawking its due. The car I’ve been watching is a 530i, Mystic Blue metallic, sand beige interior. I don’t know if it first caught my attention because of the color (unusual for a 530i, at least where I live), or if it was the big 18-inch Sport Package upgrade wheels. In any case, I looked. 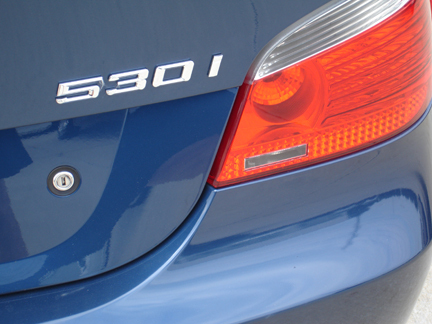 This particular 530i is a 2004, and has been in the front row of the BMW lot off and on for approaching five years. It proudly held on to its window-stickered “new”status for well over two years, it might have been three, before someone connected to the dealership removed the window sticker ($52770), and started driving the car. When the car first started being driven, I was a little shaken by it. “Did you see that 5-Series finally sold?” was the only line in an e-mail that traveled between my BMW-loving friends. The funny thing was, without explanation, we all knew what car we were talking about. We’d all been watching it. With a few thousand miles on the odometer, the 530i returned. Save for a few short-term disappearing acts in the intervening years, it’s remained parked in the dealership’s front row, still technically a new, untitled car. It’s still there today. A car languishing on a dealer lot well past its sell-by date isn’t unusual. With numerous auto industry issues, and ever-more-dire sales predictions running rampant, lots of unsold, unsaleable cars and SUVs are becoming relatively commonplace. Off the top of my head, I know where there are brand new two- and almost three-year old Buick’s sitting. Old, but still new, Chrysler’s, Fords and Mercedes R-Classes are out there. Aging, still “new,” still-on-the-lot Saabs are a dime-a-dozen and easy to find. But a BMW 530i? An unsold, orphaned, 2004? Weird. After all these years, the car seems like a friend I wave hello to in the hall at work. I pass him every day and give a friendly wave, but never really know what his story is. I look forward to crossing paths with him, and if he moves on, I’ll be sad to see him go. Previous post New BMW 7 Series: Stunning! Next post Is Chris Bangle driving the new 7 Series?